After hearing his amazing story, Omega 1 turned him into a special agent. Now Moss and two of Omega 1's best, are sent to find a saucer that went down somewhere on earth 5 days ago. The problem is, the humans have got to them already, and they're now being held in some sort of lab/military base. Agent Moss is now thrust into this life threatening situation, and knows full well that he's a fraud. Wishing he was back to his old job of abducting humans from a safe distance, he must now venture off with his fellow aliens, Slug and Scar, to find these downed agents. Help these aliens complete their mission and return home safely. 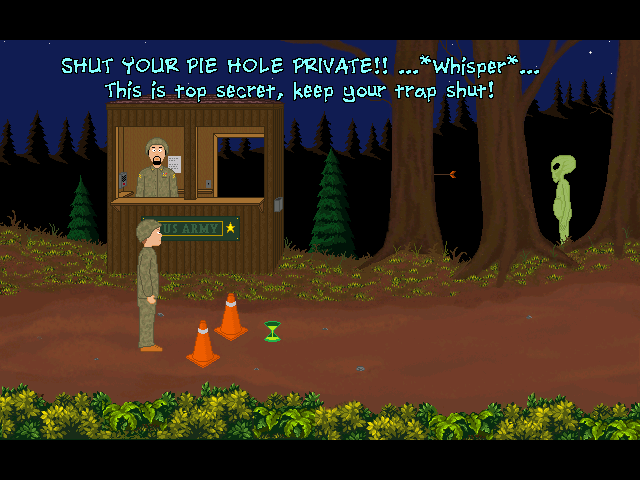 A true classic for adventure game fans! I really enjoyed this fun sequel. Nice artwork, sensible puzzles, and some very clever humour, all taken from an aliens pov. The abililty to quick jump to different areas via signs was helpful, as well as the brief peek screens to remind the player when characters should switch, showing how certain actions would connect to help the other character was a really 'nyce' touch. Going for the bonus achievements was alot of fun. Well done Nicky. Looking forward to the next chapter. For the love of Mighty Mucus, take some time out from being a human and play this game. Thoroughly enjoyable! If you liked the first Visitor game -- you will love this one. It's got the same tense, creepy atmosphere. It's got more puzzles -- which still manage to be perfectly logical, or at least very intuitive. Moss gets more screen time (alongside his fellow alien invaders), and becomes a more developed character this time. But he's still the same creepy, oddly funny guy that hates humans. By the end of the game so will you ;) Play both Visitor games NOW, you puny human! The story is fun and the setting with the agents starting on top and on bottom was excellent. The backgrounds were even better than in Visitor 1. Also there are lots of animations and fitting sound effects. The puzzles were logical and fun and the pacing was great. I only wish that there was more interaction between the two player characters. This game is definitely a MUST PLAY for all of you who like the classic p&c adventure-games! There is an interesting story, cool puzzles, different playable characters, lovely done graphics and animations, lots of humor and, and, and ... everything put together with a really lot of love to details. Let me reveal just one of those as an example (don't be afraid, it's not about a puzzle): If you leave the character of Scar while he is standing on the roof of the building, change to Moss and go with him to the pathway outside (from where he can see that part of the roof), Nicky makes it happen that you can see Scar standing over there (even if it wasn't really necessary and most of the players won't get in this situation). I am very proud to be chosen as a tester for this wonderful game and strongly recommend this one to be played and enjoyed. The perfect sequel for The Visitor. The game have the better elements of the first game and mix them with other good ideas. The puzzles are hard at the just point and the character of Agent Moss become more detailed. One of the best thing of this game are the secondary cutscene and goals that force the player to find everything. This game is the perfect freeware game and a "must" for all the old school gamers. I really enjoyed this game and I hope there will be more of these games with the same characters in the future. Funny. Good plot. Challenging two character problem solving, like playing two games. Witty dialogue. Good animation. Tour de force work. Really cool game, with lots of humor. The puzzles were just right, fair and logical, neither too easy nor too difficult. Also liked the graphics, the switching between the characters, the music and the bonus achievemets. Reminds me a little bit of "manic mansion", but this is meant as a compliment. Good work, NickyNyce, thanks a lot for making this game!